Above, these Galerucella beetles are really only 3/16 inch long but are greatly magnified in this close-up. These tiny beetles specialize in eating and laying their eggs on purple loosestrife plants. For this reason they are used to control invasive purple loosestrife. There’s a tiny new beetle in town, and this beetle is a good one – unless you’re an invasive purple loosestrife plant. In that case, you’re the beetle’s next meal, as well as food for the beetle’s caterpillars, which hatch from its eggs. The new beetle is a biocontrol agent, which is an organism that’s used to control another organism that’s a pest to humans, such as an invasive plant. In this case, the pest is purple loosestrife (Lythrum salicaria), which we see all over Westborough at this time of year. The beetle is actually two beetles – two closely related, similar-looking beetles (Galerucella calmariensis and Galerucella pusilla). They are both commonly called Galerucella beetles. The Westborough purple loosestrife biocontrol project is raising and releasing these loosestrife-eating beetles to control purple loosestrife (see story on page 1). How do the beetles control purple loosestrife? Galerucella beetles specialize in feeding on purple loosestrife. The adult beetles eat the leaves of purple loosestrife plants, but so do the beetles’ immature stages – their caterpillars. In fact, it’s the growing caterpillars that really chow down on purple loosestrife leaves and stems. Purple loosestrife is the exclusive food of these Galerucella caterpillars. Purple loosestrife and Galerucella beetles have a long history together in Europe, where purple loosestrife came from. There it’s not invasive, because Galerucella beetles and many other insects eat it. All this munching keeps purple loosestrife under control. In European wetlands it’s just one of many plants, not an invader that dominates wetlands, as happens here. Purple loosestrife arrived in the northeastern U.S. by the 1830s. Its seeds probably came in the sand and gravel that ships from Europe carried as ballast to stabilize them and then dumped here. Until recently, little could be done to combat the purple loosestrife invasion. Pulling it up, mowing it, chopping it down, and burning it – all these methods of control don’t work. The problem is that the perennial plants can sprout from pieces of roots or stems. If you don’t remove the whole plant, it just comes up again. And of course it also sprouts from seeds, which it produces in mind-boggling numbers – up to 2-1/2 million seeds per bushy plant each season. Chemical control – using herbicides – isn’t suitable for use in wetlands or near our water supplies. Fortunately there’s an ecological approach, in other words, using other living things to restore a balance. Starting in the mid-1980s, scientists in North America began searching for insects that would attack purple loosestrife but leave other plants alone. To the side, this tiny 1/4 inch orange caterpillar with black ends is the immature “eating and growing” stage of the Galerucella beetle. The caterpillars devour purple loosestrife leaves and stems, helping to control these invasive plants. Researchers screened many European insects and eventually focused on six insects: the two leaf-eating Galerucella beetles, a root-mining weevil, a flower-feeding weevil, a seed-feeding weevil, and a gall midge. In 1992, the U.S. Department of Agriculture approved the use of the Galerucella beetles as a biocontrol for purple loosestrife. In the mid-1990s the U.S Fish and Wildlife Service began releasing Galerucella beetles in two national wildlife refuges in eastern Massachusetts (Great Meadows and Parker River). If you visit them today, you won’t see lots of purple loosestrife. By now, Galerucella beetles are no strangers to eastern Massachusetts. Starting in 2000, the Massachusetts Wetland Restoration Program (WRP) began releasing them, and Mass Audubon and Mass Department of Conservation and Recreation (DCR) started doing so in 2006. The beetles have now been used in at least 43 sites in Massachusetts, including nearby Grafton and Uxbridge. So what do these Galerucella beetles look like? They are small, delicate-looking, tan beetles, only about 3/16th of an inch long – not like the big inch-long invasive Asian longhorned beetles (Anoplophora glabripennis) that threaten maples trees and others in the Worcester area and beyond. Galerucella beetles are active in the spring and summer – when purple loosestrife is coming up and blooming. They overwinter in the soil in fall and winter, when the purple loosestrife plants go dormant. These beetles lay their eggs only on purple loosestrife. Why? It’s the food plant that their caterpillars need to eat when they hatch. 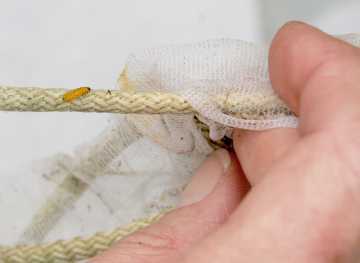 Galerucella caterpillars don’t survive when researchers try to raise them on other plants. In this way, the Galerucella beetles are like many other insects that need particular plants as food for their young. For example, beautiful monarch butterflies (Danaus plexippus) need to lay their eggs on milkweed plants, because that’s what monarch caterpillars eat. How long do Galerucella live? Their life span is about a year and revolves around purple loosestrife. Like 85 percent of insects, Galerucella beetles go through four life stages: Egg, immature larva or caterpillar, pupa, and adult. Galerucella beetles lay eggs on purple loosestrife when the plants start to grow in the spring. The eggs soon hatch into caterpillars, which devour the plants’ leaves and grow. When the caterpillars get big enough – about ¼ inch – they crawl into the soil for their 2-week pupa stage and transform into adult beetles, much as monarch caterpillars transform into butterflies. The adult beetles eat some purple loosestrife in mid-summer and then go back into the soil to overwinter. The next spring they emerge, mate, lay eggs, and die in about a month later. What happens when beetles have eaten much of the local loosestrife? The adult beetles have wings and can fly. They’re very good at searching for purple loosestrife. When new beetles first emerge from the soil in the summer, they can fly 2/3 mile to locate purple loosestrife. When adult beetles come out of the soil again after overwintering, they can fly up to 10 miles to find purple loosestrife for their eggs. Also, as with many insects and other animals, the number of Galerucella beetles varies with the size of their food supply. When there’s plenty of purple loosestrife, the number of beetles increases – just as you’ll often see lots of chipmunks after a good year for acorns. When the beetles reduce the purple loosestrife in an area, their numbers shrink to match.